Since our creation in 2007, we have developped strong knowledge in IT consulting for systems and networks. All of our services massivelly use new technologies to always bring more value to our clients. This neverending innovation research brings us to develop strong knowledge in systems and networks architectures and software developpment. We assist ours clients in the design and deployment of the infrastructure required to improve the operations of their plants. Our industrial core business positions our IT services as a tool to improve productivity and effectiveness of your business. For exemple, we propose definition, integration and administration of a cloud platform for a final client to manage and externalize its services. Ennovia assits its clients in defining functionnal specifications for business software developpment. Another element of our expertise is the knowledge of industrial communication protocols (ModBus, OPC, OPC/UA, ..) and our capacity to collect data from any compatible equipment or robot to integrate data in software like IBM PMQ, Maximo, reporting or Business Intelligence tool. This skills constitute the backbone of all of our services deliveries enriching them of inovative solutions discovered by permanent techological survey and by continuously training our teams on the best available technologies. our pertnership with IBM and its wholesaler AZLAN allow us to deliver complete infrastructure solution on support on integration. User resources access security issues management. Design, optimization and securing networks and interconnection of sites. Data protection – backups Solution. Solutions of telephony on I. These services are compatible with the Brain-Machine service. The BrainMachine is a hardware and software suite allowing to quickly implement a complete it infrastructure (sharing of files, mails, router/firewall, telephony, etc.) at a remote site. This service caters to all companies who need to rapidly deploy the physical and software necessary infrastructure to make several people able to work together on a remote site and independently. BrainMachine architecture is built on servers integrated in a compact dedicated Bay racks. The standardization of its design allows quick integration costs masteries. 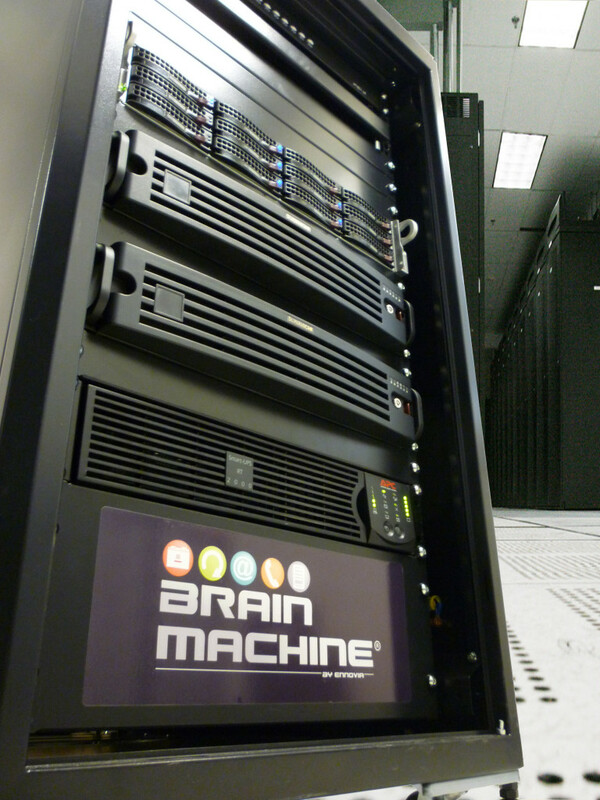 BrainMachine service is available in several versions depending on your availability and performance requirements. High Performance Computing HPC (CPU/GPU computing clusters). Definition and deployment of high availibility.virtualized.infrastructure (> 99% UP). Software virtualization : increase the availability of applications. IT Infrastructure design (physical, virtual, cloud, enhanced, mobile). Disaster recovery of activity plan. Ennovia, founded in 2007, provides innovative value services for the maintenance and operation of any industrial installation energy, nuclear, oil&amp;gas, waste management, …). The experience of our consultants and experts allows our customers to save time, optimize their processes and structure maintenance and exploitation according to best available technologies intensive use. Ennovia was created to bring innovation in the industrial sector in order to increase the competitiveness of our customers. Ennovia, founded in 2007, provides innovative value services for the maintenance and operation of any industrial installation energy, nuclear, oil&gas, waste management, …).